Hi There! 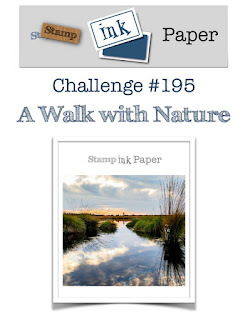 It's Tuesday again and time for another Stamp, Ink, Paper Challenge. This week it's a Walk With Nature. There are so many possibilies with this one! 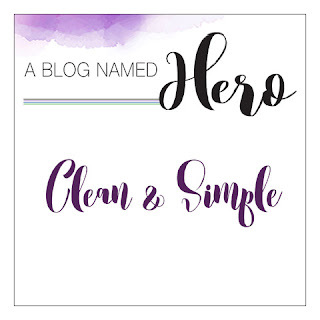 As I was going through my stamps I realized that I had never used any of the Images from My Monthly Hero kit from Hero Arts in December 2018. So of course, I used it today. I'm also entering this card in the #ablognamedhero challenge. 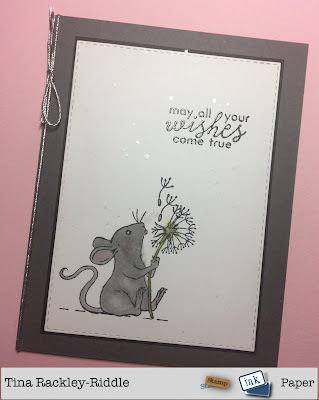 I went super clean and simple by stamping the mouse with the Dandelion in Memento Tuxedo Black Ink onto SU Whsiper White Cardstock. I used my SU Blends Alchol Markers to add just a little color. I also stamped one of the little dandelion fibers twice so that it would look like the mouse had just blown them off the dandelion. I used a T-Ruler to add some black dotted lines under the mouse to ground him. The sentiment was stamped in Versafine Black Onyx Ink and clear embossed. I used my SU Stitched Rectangle (2nd from the largest) to cut out the panel and then matted with a thin layer of SU Basic Black Cardstock. I also added just a little FSJ Sparkle Silk to add some interest. After adhering to a SU Basic Gray A2 Card Base, I added some silver cord to the fold and tied it in the upper right to balance the card out just a bit. I think it turned out super cute. I couldn't believe I hadn't used this kit earlier. I need to make a few cards out of it while it's out.